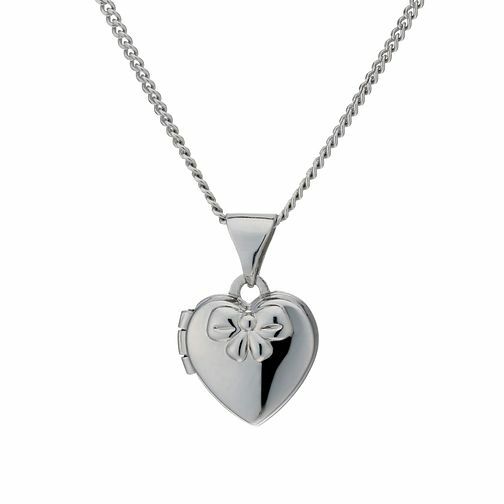 Give a gift that's sure to be treasured for many years, with this stylish children's sterling silver heart locket adorned with a pretty bow design. Finished with a fine 14" chain. Sterling Silver Children's Heart & Bow 14" Locket is rated 4.7 out of 5 by 9. Rated 5 out of 5 by Anonymous from Locket I purchased this as a Christmas Gift for my niece who is 6 years old and she absolutely loved it, it was nice stocking filler surprise. Very pleased with quality and the price. Rated 5 out of 5 by Anonymous from Graceful A beautiful locket created with elegance and grace.